Hoe's six-cylinder rotary press from the 1860s. The printing plates are located on the large cylinder in the middle. 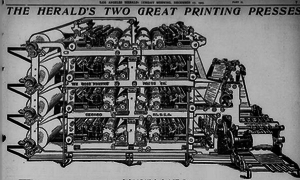 William Nicholson filed a 1790 patent for a rotary press. The rotary press itself is an evolution of the cylinder press, also patented by William Nicholson and invented by Friedrich Koenig. Rotary drum printing was invented by Richard March Hoe in 1843. An 1844 patent replaced the reciprocating platforms used in earlier designs with a fixed platform served by rotating drums, and through a series of advances a complete rotary printing press was perfected in 1846, and patented in 1847. Some sources describe the Parisian Hippolyte Auguste Marinoni as the inventor of the Rotary printing press, but this was the subject of a patent dispute that was decided in Hoe's favor. A.S. Abell of the Baltimore Sun was the first American user of the rotary press. Today, there are three main types of rotary presses; offset (including web offset), rotogravure, and flexo (short for flexography). While the three types use cylinders to print, they vary in their method. Offset lithography uses a chemical process in which an image is chemically applied to a plate (generally through exposure of photosensitive layers on the plate material). Lithography is based on the fact that water and oil do not mix, which enables the planographic process to work. In the context of a printing plate, a wettable surface (the non-image area) may also be termed hydrophilic and a non-wettable surface (the image area) hydrophobic. Gravure is a process in which small cells or holes are etched into a copper cylinder, which are able to be filled with ink. All the colours are etched in different angles, thus while printing every colour is placed in proper position to give the appropriate image. Flexography is a relief system in which a raised image is created on a typically polymer based plate. In stamp collecting, rotary-press-printed stamps are sometimes a different size than stamps printed with a flat plate. This happens because the stamp images are further apart on a rotary press, which makes the individual stamps larger (typically 1/2 mm to 1 mm). 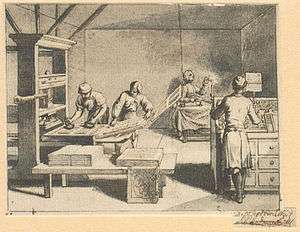 Wikimedia Commons has media related to Rotary printing presses. ↑ Meggs, Philip B. (1998). A History of Graphic Design (Third ed.). John Wiley & Sons, Inc. p. 147. ISBN 978-0-471-29198-5. ↑ Hoiberg, Dale H., ed. (2010). "Abell, A(runah) S(hepardson)". Encyclopedia Britannica. I: A-ak Bayes (15th ed.). Chicago, IL: Encyclopedia Britannica Inc. p. 26. ISBN 978-1-59339-837-8.